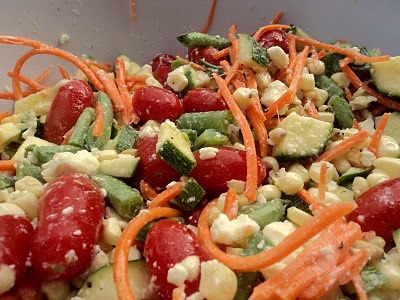 Here’s an easy summer salad recipe made with produce from Her Farms, which offers some of the most reasonably-priced farm-fresh produce available. This takes 5 minutes to throw together and will make you the most popular boy or girl at the potluck. Use a sharp knife to cut the kernels from the corn and place in a large salad bowl. Add the zucchinis, tomatoes, basil, carrots, pine nuts and feta. Toss with olive oil and lemon juice. Season with salt and pepper to taste.